Cambridge. 9/DEC/2010. - FotoInsight is launching a new website in ecember to improve the online in-browser design experience for photo calendars. In the new website, Fotoinsight’s customers will be able to create individual photo calendars without having to download additional software. With this development come also new photo calendars on photo paper. Photographic paper has come a long way over the past two hundred years. Quality photographic paper offers sharp details, brilliant, true colours and proven longevity. The new range of calendars on photographic paper is comprehensive, ranging from a desktop calendar with CD case size display for £9.99 to the practical A4 wall calendar and a new 30×30cm (12"×12") square format to the known A3 photo calendar. The photo calendars in A3 are now available not just in portrait format, but as an A3 landscape photo calendar. For those who want their pictures to be big, there’s the new A2 photo calendar size 40.6×60.9cm (16"×24"). Name calendars are a great gift idea for any opportunity like as a Christmas present, on birthdays or as a name-day gift idea. His or her name will come in a different picture every month. The integrated name feature creates personalised name calendars within minutes. Simply add a name - a picture for each month with the name drawn in will be automatically personalised. Modern computer technology will seamlessly integrate the name into each of the twelve months’ pictures creating a unique, personalised calendar gift. Thanks to the different materials and many sizes, shapes, formats and calendar templates available there should be a calendar suitable for each space or occasion. 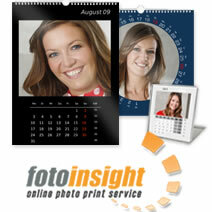 Photo calendars are a great gift idea all year around, as the user can set the starting month freely. Therefore calendars can run along the academic year or from Mother’s Day to Mother’s Day.